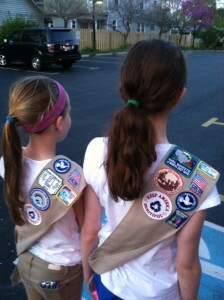 The One Million Acts of Kindness patches are showing up on Girl Scout sashes and vests across the United States. By taking a pledge of having kindness as a lifetime goal, a Girl Scout can earn a patch. There are 3.2 million Girl Scouts in the United States – 2.3 million girls and approximately 900,000 adults who work as volunteers. Our program is open to all of them, free of charge. This entry was posted on Tuesday, May 13th, 2014 at 9:10 pm	and is filed under Kindness. You can follow any responses to this entry through the RSS 2.0 feed. You can leave a response, or trackback from your own site.